Lead or join an Investors Group Walk for Alzheimer’s organizing committee! 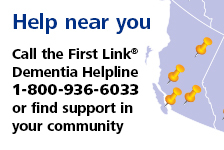 | Alzheimer Society of B.C. Home > B.C. feature stories > Lead or join an Investors Group Walk for Alzheimer’s organizing committee! Are you passionate, motivated and organized and want to make a difference in your community? Join us as a valuable part of the Investors Group Walk for Alzheimer’s organizing committee in your area. As a member, you will engage with your community to make a difference in the lives of people who have been touched by dementia. We are looking for volunteers to chair Walk committees in the following areas: Kelowna, North Island, Penticton, Richmond and Tsawwassen/Ladner. Candidates for the chair position should have some organizational skills, be enthusiastic and community-minded. The Walk chair is responsible for mobilizing and inspiring existing committee volunteers; recruiting and supporting new committee members; dividing up the work; and ensuring the team is successful at securing sponsorship, participants and pledges. The Alzheimer Society of B.C. provides in-depth training, resources and ongoing support to ensure committee leaders have the best event experience possible. Other volunteers may also be needed to serve on the Walk committee. These roles may include promotion and publicity; participant and team recruitment; sponsorship, prize and refreshment solicitation; volunteer management; accounting coordination; registration coordination; route marshal and site coordination. However you participate on the committee, you will have fun, build skills and meet amazing like-minded people who are all working towards a cause. Fundsraised at the Investors Group Walk for Alzheimer’s will support local programs and services and enable research. The Walk will take place on Sunday, May 5, 2019. If you are interested, or would like more information, contact Stacy Ashton at sashton@alzheimerbc.org or 604-742-4937.